The Greek economic recovery continues at a moderate pace, with a volatile pattern of growth. In 2Q18, GDP expanded modestly at 0.2% quarter on quarter (1.8% YoY), slowing down from an upbeat 0.9% in 1Q18. Exports were the growth driver, while investments have so far failed to confirm the exceptionally positive reading of 4Q17. The flipside of this was a softer growth drag from the goods component of imports. The good news came from the private consumption front, which is finally benefiting from the ongoing turnaround in the labour market. Employment has been expanding at an average 1.5% year on year rate over 1H18, and the unemployment rate has recently fallen again below the 20% mark for the first time since 3Q11. 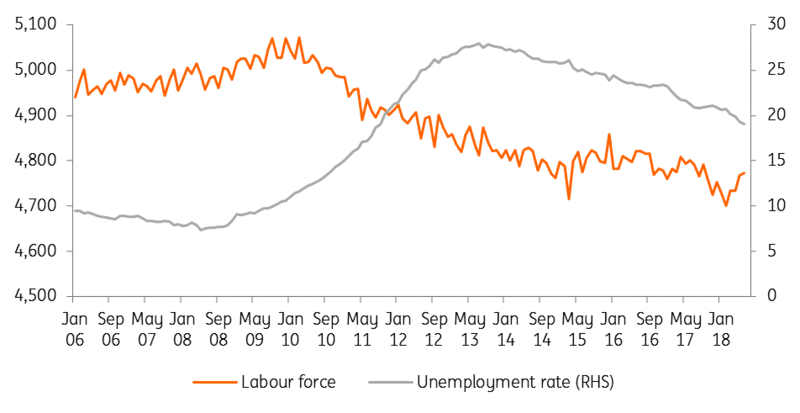 To be sure, the decline in the unemployment rate, while an undisputable positive, should be put into context, as it happened during the sharp contraction of the Greek labour force. The sustained pick-up in consumer confidence is finally showing up in hard consumption data, which posted two 0.5% QoQ increases in a row in 1Q and 2Q18. The wounds of the global financial crisis and three adjustment programs are still visible as total employment is still 17% below pre-crisis highs. Having considerably overshot its general government budget primary surplus target in 2017, Greece seems to be in a position to meet the 3.5% of GDP primary balance target in 2018. Fiscal discipline monitoring will remain a recurring feature even after the third programme ended on 20 August 2018. As the prime minister Alexis Tsipras wanted, Greece exited the program in a “clean” way, i.e. without resorting to any form of precautionary credit lines. This was made possible by the substantial €24bn liquidity buffer, funded partly with past Greek government bonds issuance, partly with domestic repo agreements and, crucially, with final disbursements from the ESM loan. The buffer aims to cover financial needs for at least 22 months after the end of the programme or more should the current stock of T-Bills be rolled over. However, the clean exit doesn't mean that Greece will soon regain full control of its state finances. The program ended with a list of to-dos, with the medium-term debt relief measures agreed on the fulfilment of public finance targets. The latter remains very ambitious: the primary surplus is targeted at 3.5% of GDP until 2022 and 2.2% of GDP after that until 2060; if realised it would represent an unprecedented achievement. Given the size of the outstanding Greek exposure to official lenders, it was decided that the country would be subject to “enhanced surveillance”, which will entail quarterly reviews. Looking forward, restoring sustainable growth conditions will likely be one of the top priorities for post-programme Greece. A new pattern of growth will have to be found with a better balance between domestic and external demand components, trying to leverage on the big and fatiguing reforms made over the crisis years. Having lost 25% of its GDP since the crisis began late in 2009, Greece desperately needs measures to redress sustainably higher economic growth. A renewed focus on investment in physical and human capital is likely to help stop the brain drain of discouraged young Greeks, who are still leaving the country in large numbers. This would likely help propel productivity, a key determinant of potential GDP. In the short run, the upcoming legislative elections, due no later than October 2019, will be the first relevant credibility test for Greece. Taking place a year after the country exits its three-year aid programme, the elections offer the government the temptation to run popular policies such as unwinding highly unpopular labour market reforms imposed by lenders. While politically effective, this could turn out to be a risky exercise, as it could entail credibility costs and could affect the attractiveness of Greece to foreign and domestic investors at a time when it is much needed. Life under the programme had many reforms passing the parliamentary test but often meeting obstacles in implementation. Life after the programme will be the right time for proper implementation, the prize being the ability to move Greece to a sustainable path of higher economic growth. 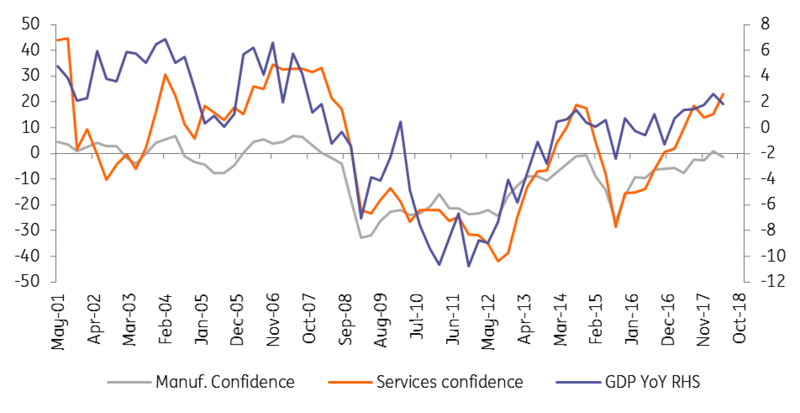 ING’s Eurozone Quarterly: A late-cycle economy?